Acoustics and Dynamics and Mechanics of Materials: Structural dynamics; linear and nonlinear vibrations; theoretical and experimental modal analysis; smart materials and structures; energy harvesting from dynamical systems; bio-inspired sensing and actuation; elastic/acoustic metamaterials and metastructures; phononic crystals; wireless acoustic power transfer; vibration/vibroacoustics of biomechanical systems. Dr. Erturk began at Georgia Tech in May 2011 as an Assistant Professor. Prior, he worked as a Research Scientist in the Center for Intelligent Material Systems and Structures at Virginia Tech (2009-2011). His postdoctoral research interests included theory and experiments of smart structures for applications ranging from aeroelastic energy harvesting to bio-inspired actuation. His Ph.D. dissertation (2009) was centered on experimentally validated electromechanical modeling of piezoelectric energy harvesters using analytical and approximate analytical techniques. Prior to his Ph.D. studies in Engineering Mechanics at Virginia Tech, Dr. Erturk completed his M.S. degree (2006) in Mechanical Engineering at METU with a thesis on analytical and semi-analytical modeling of spindle-tool dynamics in machining centers for predicting chatter stability and identifying interface dynamics between the assembly components. Dr. Erturk’s theoretical and experimental research interests are centered around the intersection of smart structures and dynamical systems to address cutting-edge research problems, including low-power electricity generation via energy harvesting (e.g. from vibration, elastic/acoustic waves, air/water flow, etc. ), bio-inspired nonlinear actuation and hydrodynamic thrust generation using flexible piezoelectric materials, vibration attenuation in flexible linear/nonlinear structures via passive and active metamaterials, wireless acoustic (ultrasound) power transfer, phononic crystal-based elastic/acoustic wave guiding, exploiting strain gradient-induced polarization and size effects in elastic dielectrics, among others. 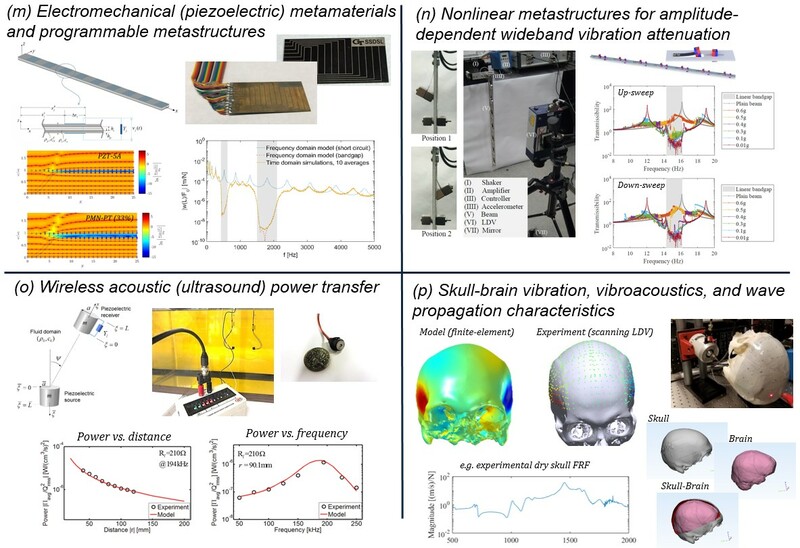 Most recent research in Dr. Erturk’s Smart Structures and Dynamical Systems Laboratory (SSDSL) also involves the leveraging of vibration and acoustic behaviors in biomechanical systems (e.g. skull-brain as a dynamical system). Some examples of recent and ongoing research are described below. One of the primary research interests in SSDSL is exploiting nonlinear dynamic phenomena in emerging fields. For instance, nonlinear electromechanical structures are leveraged for frequency bandwidth enhancement, nonlinear frequency-up conversion, and modal interactions in vibration energy harvesting (a-c). The goal in the field of vibration energy harvesting is to convert ambient vibrations into electricity toward enabling self-powered electronic components for applications such as wireless sensor networks, wearable electronics, and ultimately the Internet of Things. Nonlinear energy harvesters offer orders of magnitude larger frequency bandwidth as compared to their linear counterparts, yielding efficient energy conversion over a wide range of ambient vibration frequencies. Beyond prototype design, development, and fabrication, SSDSL research on the subject aims to understand and exploit complex dynamic interactions of intentionally designed (a-c) and inherently present material and dissipative nonlinearities (d) through rigorous experiments and high-fidelity modeling. The combination of mechanical (e.g. material) nonlinearities with nonlinear non-ideal components (e.g. diodes) in the electrical domain is required to obtain a stable electrical signal in order to charge a storage component, yielding complex dynamics and amplitude dependent behavior as modeled and analyzed (e) in SSDSL. As another critical research topic, piezoelectric shunt damping of flexible nonlinear structures via nonlinear circuits for bifurcation suppression and novel nonlinear electrical shunt circuits (e.g. piezoelectric nonlinear energy sink) for wideband vibration attenuation are explored (f). 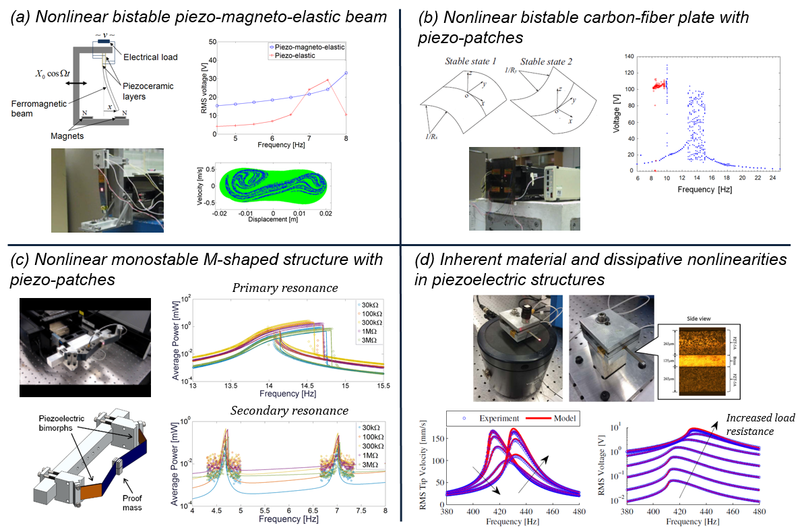 Flexible piezoelectric structures, such as macro-fiber composites with interdigitated electrodes, strike a balance between the actuation force and deformation capabilities, resulting in substantial geometric, material, and dissipative nonlinearities, which are modeled and analyzed (g). Such piezoelectric materials are employed in SSDSL as internally actuated bio-inspired aquatic locomotion platforms to imitate fish-like swimming (h) and to understand fluid-structure interaction of complex fin motions. The transformation of airflow into aeroelastic vibrations of piezoelectric structures in high wind areas is another way of low-power electricity generation at small geometric scales for powering small electronic components. The resulting vibrations due to fluid-structure interaction are typically more complicated than simple standing wave mode shapes, rendering electrode segmentation to avoid charge cancellation a more involved task (i). On another topic, structure-borne propagating elastic waves are explored as a source of energy. Specifically, phononic crystal lens (j) and structurally-embedded mirror (k) concepts are explored numerically and experimentally to spatially focus and thereby enhance the harvested electrical energy by an order of magnitude. Metamaterial concepts are also explored in SSDSL for low-frequency bandgap formation and vibration attenuation via locally resonant metastructures (l), leading to a general theoretical modeling and analysis framework for 1D and 2D structures as well as experimental validations. The electromechanical counterparts of metamaterials and metastructures that leverage piezoelectricity offer a plethora of opportunities since the dynamics of piezoelectric unit cells (i.e. building blocks) can be tailored on demand via analog and/or digital circuitry (m). Such programmable piezoelectric metamaterials and metastructures are researched in SSDSL for altering vibration attenuation and wave propagation characteristics of structures. Designed nonlinearities - as in (a-c) - are of interest in metastructures as well. Bistable unit cells exhibit linear intrawell, nonlinear intrawell, and nonlinear interwell oscillations for locally resonant, softening, and chaotic dynamics, respectively, yielding ultra-broadband behavior especially for moderate to large amplitude excitations (n). Another research topic explores wireless acoustic power transfer (from a piezoelectric transmitter to a receiver) for deep-implanted and inaccessible wireless electronic components and sensors (o). As a last example, skull-brain vibration/vibroacoustics and their combination with high frequency wave propagation are explored (p) to improve trans-skull wave transmission and focusing. The interdisciplinary research topics mentioned here utilize both theoretical and experimental techniques. The students involved develop advanced modeling and analysis skills along with a significant hands-on experience and appreciation of the experimental aspects. Conducting research in the foregoing topics provide the students with a bridge between the concepts of structural dynamics/vibrations and smart materials as well as theoretical and experimental modal analysis with applications to cutting-edge problems that are inherently of multiphysics nature. SSDSL students are also offered the opportunities to interact and collaborate with other research groups, develop strong technical communication and presentation skills, and regularly participate in technical conferences. Ph.D. and M.S. alumni from Dr. Erturk’s group work in academia at top research universities (as tenure-track faculty), government laboratories, and corporate research. SSDSL research has been funded by various agencies including the National Science Foundation, the National Institute of Standards and Technology, and the Air Force Office of Scientific Research, among others. Sugino, C., Ruzzene, M., and Erturk, A., 2018, “Design and Analysis of Piezoelectric Metamaterial Beams with Synthetic Impedance Shunt Circuits,” IEEE/ASME Transactions on Mechatronics, 23, pp. 2144-2155. Sousa, V.C., Tan, D., De Marqui, Jr., C., and Erturk, A., 2018, “Tunable Metamaterial Beam with Shape Memory Alloy Resonators: Theory and Experiment,” Applied Physics Letters, 113, 143502. Silva, T., Clementino, M., De Marqui, Jr., C., and Erturk, A., 2018, “An Experimentally Validated Piezoelectric Nonlinear Energy Sink for Wideband Vibration Attenuation,” Journal of Sound and Vibration, 437, pp. 68-78. Tan, D., Yavarow, P., and Erturk, A., 2018, “Resonant Nonlinearities of Macro-Fiber Composite Cantilevers with Interdigitated Electrodes in Energy Harvesting,” Nonlinear Dynamics, 92, pp. 1935-1945. De Marqui, Jr., C., Tan, D., and Erturk, A., 2018, “On the Electrode Segmentation for Piezoelectric Energy Harvesting from Nonlinear Limit Cycle Oscillations in Axial Flow,” Journal of Fluids and Structures, 82, pp. 492-504. Sousa, V.C., Sugino, C., De Marqui, Jr., C., and Erturk, A., 2018, “Adaptive Locally Resonant Metamaterials Leveraging Shape Memory Alloys,” Journal of Applied Physics, 124, 064505. Tan, D., Yavarow, P., and Erturk, A., 2018, “Nonlinear Elastodynamics of Piezoelectric Macro-Fiber Composites with Interdigitated Electrodes for Resonant Actuation,” Composite Structures, 187, pp. 137-143. Sugino, C., Ruzzene, M., and Erturk, A., 2018, “Merging Mechanical and Electromechanical Bandgaps in Locally Resonant Metamaterials and Metastructures,” Journal of the Mechanics and Physics of Solids, 116, pp. 323-333. Silva, T., Clementino, M., Erturk, A., and De Marqui, Jr., C. 2018, “Equivalent Electrical Circuit Framework for Nonlinear and High Quality Factor Piezoelectric Structures,” Mechatronics, 54, pp. 133-143. Tol, S., Degertekin, F.L., and Erturk, A., 2017, “Structurally-Embedded Reflectors and Mirrors for Elastic Wave Focusing and Energy Harvesting,” Journal of Applied Physics, 122, 164503. Sugino, C., Xia, Y., Leadenham, S., Ruzzene, M., and Erturk, A., 2017, “A General Theory for Bandgap Estimation in Locally Resonant Metastructures,” Journal of Sound and Vibration, 406, pp. 104-123. Tol, S., Degertekin, F.L., and Erturk, A., 2017, “Phononic Crystal Luneburg Lens for Omnidirectional Elastic Wave Focusing and Energy Harvesting,” Applied Physics Letters, 111, 013503. Tol, S., Xia, Y., Ruzzene, M., and Erturk, A., 2017, “Self-Bending Elastic Waves and Obstacle Circumventing in Wireless Power Transfer,” Applied Physics Letters, 110, 163505. Sugino, C., Leadenham, S., Ruzzene, M., and Erturk, A., 2017, “An Investigation of Electroelastic Bandgap Formation in Locally Resonant Piezoelectric Metastructures,” Smart Materials and Structures, 26, 055029. Moura, A.G. and Erturk, A., 2017, “Electroelastodynamics of Flexoelectric Energy Conversion and Harvesting in Elastic Dielectrics,” Journal of Applied Physics, 121, 064110. Shahab, S. and Erturk, A., 2017, “Coupling of Experimentally Validated Electroelastic Dynamics and Mixing Rules Formulation for Macro-Fiber Composite Piezoelectric Structures,” Journal of Intelligent Material Systems and Structures, 28, pp. 1575–1588. Sugino, C., Leadenham, S., Ruzzene, M., and Erturk, A., 2016, “On the Mechanism of Bandgap Formation in Locally Resonant Finite Elastic Metamaterials,” Journal of Applied Physics, 120, 134501. 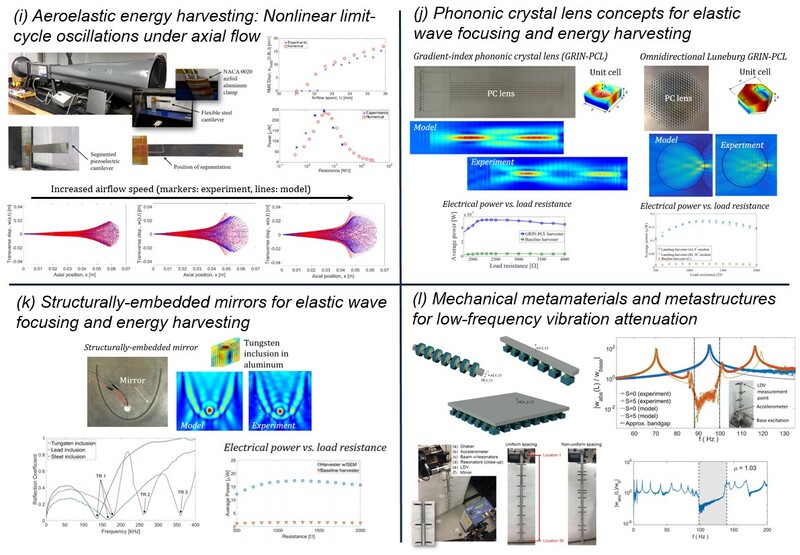 Tol, S., Degertekin, F.L., and Erturk, A., 2016, “Gradient-Index Phononic Crystal Lens-based Enhancement of Elastic Wave Energy Harvesting,” Applied Physics Letters, 109, 063902. Shahab, S. and Erturk, A., 2016, “Electrohydroelastic Euler-Bernoulli-Morison Model for Underwater Resonant Actuation of Macro-Fiber Composite Cantilevers,” Smart Materials and Structures, 25, 105007. Erturk, A., 2015, “Macro-Fiber Composite Actuated Piezoelectric Robotic Fish,” Chapter 9 in Robot Fish: Bio-Inspired Fishlike Underwater Robots, pp. 255-283, Springer, New York (Eds. Du, R., Li, Z., Youcef-Toumi, K., and Valdivia y Alvarado, P). Leadenham, S. and Erturk, A., 2015, “Nonlinear M-Shaped Broadband Piezoelectric Energy Harvester for Very Low Base Accelerations: Primary and Secondary Resonances,” Smart Materials and Structures, 24, 055021. Shahab, S., Gray, M., and Erturk, A., 2015, “Ultrasonic Power Transfer from a Spherical Acoustic Wave Source to a Free-Free Piezoelectric Receiver: Modeling and Experiment,” Journal of Applied Physics, 117, 104903. Leadenham, S. and Erturk, A., 2015, “Unified Nonlinear Electroelastic Dynamics of a Bimorph Piezoelectric Cantilever for Energy Harvesting, Sensing, and Actuation,” Nonlinear Dynamics, 79, pp. 1727-1743. Leadenham, S. and Erturk, A., 2014, “M-Shaped Asymmetric Nonlinear Oscillator for Broadband Vibration Energy Harvesting: Harmonic Balance Analysis and Experimental Validation,” Journal of Sound and Vibration, 333, pp. 6209-6223. Anton, S.R., Farinholt, K.M., and Erturk, A., 2014, “Piezoelectret Foam-based Vibration Energy Harvesting,” Journal of Intelligent Material Systems and Structures, 25, pp. 1681-1692. Deng, Q., Kammoun, M., Erturk, A., and Sharma, P., 2014, “Nanoscale Flexoelectric Energy Harvesting,” International Journal of Solids and Structures, 51, pp. 3218-3225. Daqaq, M.F., Masana, R., Erturk, A., and Quinn, D.D., 2014, “On the Role of Nonlinearities in Vibratory Energy Harvesting: A Critical Review and Discussion,” ASME Applied Mechanics Reviews, 66, 040801. Carrara, M., Cacan, M.R., Toussaint, J., Leamy, M.J., Ruzzene, M., and Erturk, A., 2013, “Metamaterial-Inspired Structures and Concepts for Elastoacoustic Wave Energy Harvesting,” Smart Materials and Structures, 22, 065004. Zhao, S. and Erturk, A., 2013, “On the Stochastic Excitation of Monostable and Bistable Electroelastic Power Generators: Relative Advantages and Tradeoffs in a Physical System,” Applied Physics Letters, 102, 103902. Cunefare, K.A., Skow, E.A., Erturk, A., Savor, J., Verma, N., and Cacan, M.R., 2013, “Energy Harvesting from Hydraulic Pressure Fluctuations,” Smart Materials and Structures, 22, 025036. Cen, L. and Erturk, A., 2013, “Bio-Inspired Aquatic Robotics by Untethered Piezohydroelastic Actuation,” Bioinspiration and Biomimetics, 8, 016006. Zhao, S. and Erturk, A., 2013, “Electroelastic Modeling and Experimental Validations of Piezoelectric Energy Harvesting from Broadband Random Vibrations of Cantilevered Bimorphs,” Smart Materials and Structures, 22, 015002. Anton, S.R., Erturk, A., and Inman, D.J., 2012, “Multifunctional Unmanned Aerial Vehicle Wing Spar for Low-Power Generation and Storage,” AIAA Journal of Aircraft, 49, pp. 292-301. Erturk, A. and Delporte, G., 2011, “Underwater Thrust and Power Generation Using Flexible Piezoelectric Composites: An Experimental Investigation Toward Self-Powered Swimmer-Sensor Platforms,” Smart Materials and Structures, 20, 125013. Erturk, A. and Inman, D.J., 2011, “Broadband Piezoelectric Power Generation on High-Energy Orbits of the Bistable Duffing Oscillator with Electromechanical Coupling,” Journal of Sound and Vibration, 330, pp. 2339-2353. Stanton, S.C., Erturk, A., Mann, B.P., and Inman, D.J., 2010, “Resonant Manifestation of Intrinsic Nonlinearity within Electroelastic Micropower Generators,” Applied Physics Letters, 97, 254101. Anton, S.R., Erturk, A., and Inman, D.J., 2010, “Multifunctional Self-Charging Structures using Piezoceramics and Thin-Film Batteries,” Smart Materials and Structures, 19, 115021. Stanton, S.C., Erturk, A., Mann, B.P., and Inman, D.J., 2010, “Nonlinear Piezoelectricity in Electroelastic Energy Harvesters: Modeling and Experimental Identification,” Journal of Applied Physics, 108, 074903. Kong, N., Ha, D.S., Erturk, A., and Inman, D.J., 2010, “Resistive Impedance Matching Circuit for Piezoelectric Energy Harvesting,” Journal of Intelligent Material Systems and Structures, 21, pp. 1293-1302. Arrieta, A.F., Hagedorn, P., Erturk, A., and Inman, D.J., 2010, “A Piezoelectric Bistable Plate for Nonlinear Broadband Energy Harvesting,” Applied Physics Letters, 97, 104102. Erturk, A., Vieira, W.G.R., De Marqui, Jr., C., and Inman, D.J., 2010, “On the Energy Harvesting Potential of Piezoaeroelastic Systems,” Applied Physics Letters, 96, 184103. Erturk, A., Hoffmann, J., and Inman, D.J., 2009, “A Piezomagnetoelastic Structure for Broadband Vibration Energy Harvesting,” Applied Physics Letters, 94, 254102. Erturk, A.and Inman, D.J., 2009, “An Experimentally Validated Bimorph Cantilever Model for Piezoelectric Energy Harvesting from Base Excitations,” Smart Materials and Structures, 18, 025009. Erturk, A. and Inman, D.J., 2008, “A Distributed Parameter Electromechanical Model for Cantilevered Piezoelectric Energy Harvesters,” ASME Journal of Vibration and Acoustics, 130, 041002. Erturk, A., Budak, E., and Ozguven H.N., 2007, “Selection of Design and Operational Parameters in Spindle-Holder-Tool Assemblies for Maximum Chatter Stability by Using a New Analytical Model,” International Journal of Machine Tools and Manufacture, 47, pp. 1401-1409. Budak, E., Erturk, A., and Ozguven, H.N., 2006, “A Modeling Approach for Analysis and Improvement of Spindle-Holder-Tool Assembly Dynamics,” CIRP Annals – Manufacturing Technology, 55, pp. 369-372. Erturk, A., Ozguven, H.N., and Budak, E., 2006, “Analytical Modeling of Spindle-Tool Dynamics on Machine Tools using Timoshenko Beam Model and Receptance Coupling for the Prediction of Tool Point FRF,” International Journal of Machine Tools and Manufacture, 46, pp. 1901-1912.